In his letter to Thomas Johnes dated 4 January 1806 and published as an introduction to A Father’s Memoirs of His Child (1806), Benjamin Heath Malkin provides much information about and kind words for William Blake, the designer of “the ornamental device, round the portrait in this book.”1↤ 1 Malkin’s discussion of Blake is reprinted in G. E. Bentley, Jr., Blake Records (Oxford: Clarendon, 1969), pp. 421-431. Malkin, however, neglects to mention the engraver of this device, Robert Hartley Cromek, who had much to do with Blake and his vicissitudes between 1805 and 1808. Fifty-seven years later, in Alexander Gilchrist’s biography of Blake, there appears the additional information that “Blake designed, and originally engraved, the ‘ornamental device’ to the frontispiece for Malkin’s A Father’s Memoirs of His Child, but it was erased before the appearance of the work, and the same design reengraved by Cromek.”2↤ 2 Alexander Gilchrist, Life of William Blake, “Pictor Ignotus” (London and Cambridge: Macmillan, 1863), I, p. 210. It is a curious assertion and, without corroboration, lonely as a cloud. Recently, however, I have found information which has led me to the print Gilchrist contends Blake made. It comes from R. H. Cromek’s son, Thomas Hartley Cromek (1809-1873), who in 1864 wrote a MS memoir of his father. In it he discloses that he possesses a proof print of the original engraving Gilchrist describes: ↤ 3 “Memorials of the Life of R. H. Cromek. Engraver. F[ellow] A[ntiquaries] S[ociety] Edinbr. Editor of the ‘Reliques of Burns’; ‘Remains of Nithsdale and Galloway Song’ &c with the unpublished correspondence on those works; and other papers relative to his professional and literary career. Collected and Edited by his son.” Thomas H. Cromek’s “Memorials” was never published, and two MS versions of it, one dated 23 December 1864 and the other dated 27 July 1865, survive in the collections of Cromek’s present-day heirs, Mr. Paul Warrington and Mr. Wilfred Warrington, whose permission to publish parts of these and other materials in their possession I gratefully acknowledge. The working of the two “Memorials” MSS is nearly identical; quotations, however, have been taken from the “Memorials” bearing the later date. The print is now in the British Museum, for in 1867 Thomas Cromek included it in a group of 119 engravings and drawings by R. H. Cromek which he presented to the Print Room (now the Department of Prints and Drawings). Thomas Cromek’s daughter, Mary Cromek, makes specific reference to the print in her letter of 9 April 1867 to Mr. W. Reid of the British Museum: “Together with that of young Malkin there is also Blake’s engraving, probably a unique impression.”4↤ 4 The letter is pasted on a page at the beginning of the volume. Thomas Cromek suffered paralysis in his last years, rendering him unable to write, and his daughter, Mary Cromek, therefore attended to his correspondence. In the volume of Cromek’s works, the alleged Blake engraving is mounted on page 42 and numbered 91 (Plate 1). Cromek’s own proof engraving, numbered 92, is mounted below it on the same page (Plate 2). The “unique impression,” which has the same dimensions (7 3/4 × 5 3/16 in.) as the published print, clearly differs from the published print in several ways. First, the rays of sunlight are presented as long, slender shafts, rather like those in Blake’s own engraving of “Death’s Door,” instead of the stylized, regular rays in the published version which resemble so many spotlight beams. Second, the clouds are shaped and arranged differently. Third, there are many small differences between the two versions in the hair, drapery, hands, and feet of the figures in the ornamental device, as well as in the positions of the figures. Particularly noteworthy is the refined curve of the begin page 61 | ↑ back to top teacher’s neck and shoulder, rather than the inelegant and strained angle of her head, neck, and shoulder in the published version. The published version indeed seems inferior in both design and execution to this presumably earlier print. The “fragments of lettering” Thomas Cromek refers to confirm Blake’s association with the print. Along the left-hand border are printed in letter-press “reast,” and “ss,” and along the right-hand border “BA,” “The,” “Sec;” “So,” “But,” “Th,” and “Ra.” These words and word fragments match exactly those along the right-hand border of page 26 and the left-hand border of page 19 of William Hayley’s Designs to A Series of Ballads (Chichester: J. Seagrave, 1802). On the verso of the sheet along the left-hand border are printed “nt” and the catchword “With” and along the right-hand border “R,” “S,” “L,” “O,” and “Sh.” These words and fragments correspond exactly with those along the right-hand border of page 20 and left-hand border of page 25 of Hayley’s Ballads. Blake had a generous supply of quarto sheets of Hayley’s Ballads because the first four numbers of the projected series of fifteen had sold so poorly, in spite of Hayley’s professed intention of publishing and selling the Ballads “for the sake of serving” Blake, whose engraved designs accompanied the ballads.5↤ 5 Letter to Lady Hesketh, 24 May 1802; transcribed in Blake Records, p. 96. The Ballads instead served Blake chiefly as scrap paper. He drew various sketches in the ample spaces between the printed pages of the sheets or otherwise used the sheets. To date, twenty-one specific instances of his doing so have been noted.6↤ 6 G. E. Bentley, Jr., “The Date of Blake’s Pickering Manuscript or The Way of a Poet with Paper,” Studies in Bibliography, 19 (1955), 232-43 and Karen G. Mulhallen, “‘For Friendship’s Sake’: Some Additions to Blake’s Sheets for Designs To A Series of Ballads (1802),” Studies in Bibliography, 29 (1976), 331-41. For bibliographic information about Hayley’s Ballads, see G. E. Bentley, Jr., Blake Books (Oxford: Clarendon, 1977), pp. 572-75 and Roger R. Easson and Robert N. Essick, William Blake: Book Illustrator (Normal, Illinois: American Blake Foundation, 1972), pp. 31-33. I wish to thank Prof. Bentley for his help and encouragement in preparing this article. Pages 20, 25, and 26 produce the same exact fit with the words and letters that show on the sheet. Blake used copies of this sheet to draw four of the sketches noted by Bentley and Mulhallen, one between pages 26 and 19 (no. 3 in Mulhallen) and three between pages 20 and 25 (nos. 5 and 11 in Bentley and no. 6 in Mulhallen). The Malkin print, however, marks the only known instance of Blake’s printing an engraving impression on a sheet from Hayley’s Ballads. The Malkin print also appears to be the earliest known instance of Blake’s using a sheet of the Ballads as scrap paper, the next earliest being his letter to Richard Phillips dated 14 October 1807 (no. 9 in Bentley). The published version of the Malkin print, however, was re-engraved by Cromek—or at least the “ornamental device” originally engraved by Blake. According to his son in the “Memorials,” Cromek had nothing to do with the stipple portrait of young Malkin, which actually was completed by another engraver: “The medallion Portrait is in the same unfinished state in Blake’s print, and in my father’s proof: it was, no doubt, engraved by Robt Cooper.”7↤ 7 “Memorials.” Thomas Cromek arrives at this conclusion by pointing out first that his father seems never to have executed a stipple engraving, except for a medallion portrait of Dante dated 1802 and a portrait of Romney Robinson for William Hayley’s Life of Romney (1809), and second that the signature on the engraved portrait of Robinson seems to have been altered: ↤ 8 Cromek elsewhere gives Miss Kearsley’s address as 25, Alfred Place, Bedford Square, London (as of 1862). I have not been able to learn any other details about her. ↤ 9 In a letter of 15 July 1805 which Thomas Cromek transcribes in his “Memorials,” Hayley thanks Cromek for the engraving of Romney Robinson and praises “the fidelity, tenderness, and spirit, with which your friend has executed his very interesting portrait.” The statement suggests to Thomas Cromek that Hayley knew Cooper had engraved the portrait—or at least that Cromek had not. I have three impressions of the plate;—one has the name of Robert Cooper; the other two—Robert Cromac. For some time I was much puzzled with these facts: at last, I was glad to receive a satisfactory explanation from my highly-gifted friend, [Miss del.] Harriet Kearsley,8 who wrote to me as follows—“If you examine it carefully, you will see by the crowding of the three last letters, the inequality of the strokes of the m, the first of which is longer than the other two; the r which looks as if made out of an o; and the c, which is not a good one,—but is top-heavy, like an r, that Cooper was the original name, and that the error was afterwards corrected.” Now, as this plate, and those of Dante and of young Malkin are the only specimens of dotted engraving bearing my father’s name; to which may be added the evidence of Hayley’s letter to my father;9 I feel quite sure that none of these portraits were [sic] engraved by him, but that they were all the work of Robert Cooper, whom my father seems to have employed occasionally. The information about Blake’s Malkin engraving reached Gilchrist’s widow in 1862, and she incorporated it in her husband’s biography in a way not satisfactory to Thomas Cromek: ↤ 10 William Edward Frost (1810-1877) was a painter chiefly of scenes derived from literary works, especially those of Spenser, Milton, and Shakespeare. He was elected an associate of the Royal Academy in 1846 and a member in 1870. In William Blake, II, 263, Gilchrist transcribes the contents of a previously unknown Prospectus by Blake dated 10 October, 1793, made available to him “through perseveringly kind efforts on the part of Mr. Frost.” See also Bentley, Blake Books, p. 450. ↤ 11 The statement appears in a MS volume by Thomas Cromek containing extracts from Gilchrist’s biography of Blake and other works which discuss R. H. Cromek, with Thomas Cromek’s responses to these extracts written on the facing page. The volume is in the possession of Mr. Paul Warrington. 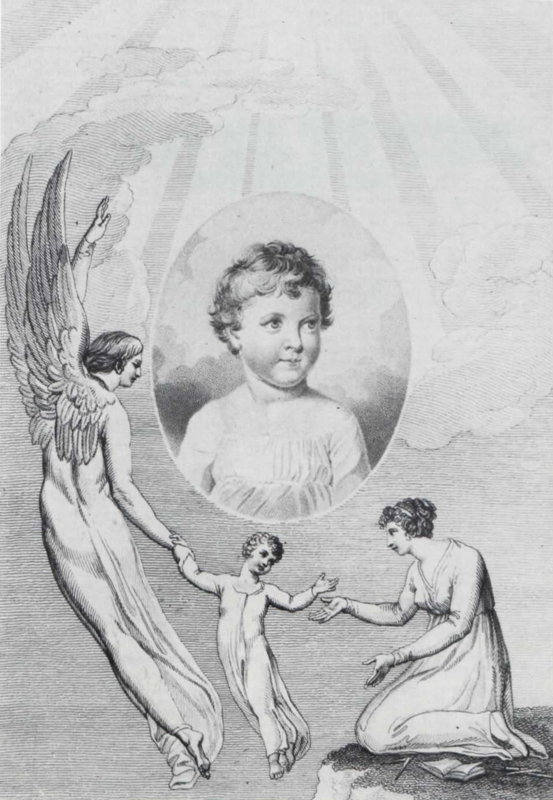 1 Proof of frontispiece to Malkin’s A Father’s Memoirs of His Child (1806), designed by Blake and engraved by R. H. Cromek, British Museum Department of Prints and Drawings. 2 Blake’s own engraving of his design, printed on a quarto sheet of Hayley’s Ballads. British Museum Department of Prints and Drawings. Thomas Cromek’s complaint has grounds, for the wording Mrs. Gilchrist chooses implies that no impression of Blake’s Malkin engraving survives. His interpreting the oversight as a personal affront, however, seems to be stretching a point. Other information incorporated in Gilchrist’s biography of Blake from items in the possession of Thomas Cromek has to do with the engraving Cromek had made from Stothard’s Canterbury Pilgrims painting. This information was evidently obtained not from Thomas Cromek, but from Anne Eliza Bray, the author of The Life of Thomas Stothard, R.A. More than two years after its publication in 1852, Thomas Cromek wrote a letter to her dated 8 October 1854 in which he attempted to correct misinformation in her biography by quoting documents relating to the Canterbury Pilgrims engraving that were in his possession. For instance, in order to dispute the figure of 330 guineas Mrs. Bray states Cromek was to pay Schiavonetti for the Canterbury Pilgrims engraving, he refers to a bill for £75 to R. H. Cromek from Schiavonetti dated 23 November 1809, to a receipt from Schiavonetti dated 12 December 1809 and worded “Received of R. H. Cromek, the sum of two Hundred Pounds, in part of 840£ for Engraving Stothard’s Picture of the Canterbury Pilgrims,” and to a memorandum of Cromek’s delineating the “Expenses attending the completion of the Pilgrims, from the Etching, as left by Mr. Schiavonetti. The Plate was begun in the 20th Sepr 1810.” Immediately below are the subsequent dates and amounts “Paid [to] Mr Engleheart,” totalling forty-four pounds and one shilling, with the last entry dated December 31.12↤ 12 Thomas Cromek transcribes his letter to Mrs. Bray in his “Memorials”; the documents are in the collection of Mr. Paul Warrington. These documents clearly are the basis for Gilchrist’s reporting that “Schiavonetti was to have had £840 for his engraving, but only lived to receive or entitle himself to £275. In the following autumn . . . the plate was confided to George Engleheart, who worked on it from 20th September to the end of December, receiving some £44.”13↤ 13 William Blake, I, pp. 239-40. Gilchrist learned as well from Thomas Cromek’s letter to Mrs. Bray that Cromek’s widow was forced to borrow money from her father in order to have the engraving completed, although he perhaps mercifully neglects to mention that her father required her to repay not only the loan but also interest upon it. Gilchrist’s biography therefore benefitted from various documents of R. H. Cromek preserved and transmitted by his son. In addition, these documents, as well as Thomas Cromek’s “Memorials” and other writings about his father, enable us to locate the Malkin engraving the biography mentions and to identify it with confidence as Blake’s own work. Blake’s engraving the design and Cromek’s erasing it to re-engrave the design himself suggests that the two men had differences and misunderstandings even in their first collaboration. Perhaps the Malkin print can be regarded as an indication of the difficulties to come in the Grave and Canterbury Pilgrims projects, in which both Blake and Cromek had much more at stake. 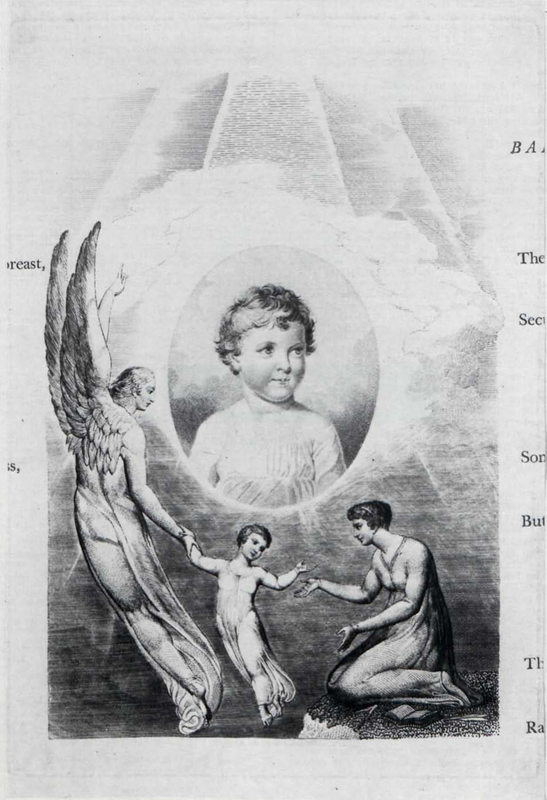 Whatever the reasons were for Cromek’s destroying Blake’s engraving, he thought enough of Blake’s proof to keep it, and his son thought enough of it to present it to the British Museum. Now it finally can be added to the catalog of Blake’s works.